Convivium: You’ve said that you “fell in love with music when you were just a little girl” and that you would sing duets with your father and listen to your mother sing hymns as she went about her day. Is there a particular song of faith that you can identify as shaping your approach towards worship even as a young child? Brooke Nicholls: I do really love hymns in general. They really played a role in shaping my heart for worship, definitely. On my last record, I put on three hymns. I put “Blessed Assurance,” “How Great Thou Art,” and “Victory in Jesus.” I always come back to “Blessed Assurance,” to be honest with you. The lyrics, “Blessed assurance, Jesus is mine,” really resonate with me. We have this assurance, this confidence and a guaranteed fact and the Scriptures tell us that with absolute certainty that we can know that we have eternal life through Jesus. C: Tell us more about the musical influences of your childhood. BN: Whenever Hillsong came to Detroit, my parents without a question took us to see them. I can remember at this specific concert, Darlene Zschech was singing “Shout to the Lord” and I was moved by the Holy Spirit in that moment. I was looking up at Darlene, tears running down my face and watching the Holy Spirit move through her as she led a group of people into the presence of God. I’ll never forget that moment. I remember thinking at that moment: "I want to do this. Jesus, how can I do this?" I also loved the music of Steven Curtis Chapman, Michael W. Smith, and Amy Grant. C: You first broke got into the music industry in your early twenties, playing shows and writing songs in an attempt to break. What led to your decision to pursue a career in the pop industry? BN: I had always liked music. I always liked writing, and I always loved playing. It was a very organic process. I began playing shows and started to get a good response. I was young and just pursued what felt right at the time. I was a small town girl and having people respond to my music really cheered me on. In terms of corporate worship, I want to help bring people into the presence of God. I don’t just want an emotional experience. C: You’ve said that you “failed time and time again” in the music industry and that you “had an unsettled feeling” for the duration of time you spent pursuing a career in pop. Can you identify a moment in which you surrendered your music career to the Lord? BN: This was a process that unfolded over years. People would always pull me aside and say: "You know, Brooke, you were called to sing for Jesus." I was stubborn and young and loved the direction I was taking. I always would take those comments, put them in my back packet and just keep on moving. It wasn't until my relationship with Jesus matured that I was able to hear him more clearly. He started speaking different desires into my heart and into my life. It was just a heart shift, but one that took place gradually. C: You released your debut worship album, Found In You, on December 3rd, 2016. You performed at last year’s Gospel Music Awards. What is the story behind the song “Home”? BN: “Home” came to me one night. I was sitting at the piano and prayed: "God, give me a song tonight. What do you want me to sing about?" I began to reflect on the often-overwhelming sense we all get that there's so much going on in the world. It sometimes feels as though there is so much devastation, so much heartbreak. I began to reflect on Scripture that says, “He will wipe every tear from their eye. There will be no more death, no more sorrow, no more crying, no more pain. All these things are gone forever.” And then it says, “Behold…I'm making all things new.” I pictured what it would be like to stand before the King of Kings, in awe of His presence, repeating: “Holy, holy, holy is the Lord God Almighty.” We are told that the former things of this life will pass away and that God makes all things new. C: You’ve toured this past year with The City Harmonic, led worship from coast to coast within Canada, and have recently returned from Slovenia where you spent time with Greater Europe Mission and the C4 Worship team. Are there common themes that connect these musicians who have dedicated their craft in praise of God? 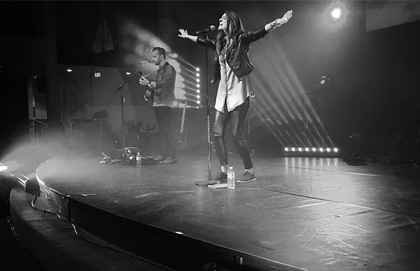 BN: I feel as though God has called all of these musicians — The City Harmonic, All Sons and Daughters, Dan Bremnes — to follow the call God has placed on their life despite the cost. Every one of these friends that I've met and traveled with, they've all had trials and tribulations in their life. Yet with the strength of Christ, they've been able to get through the trials they have faced, all the while continuing to share the Good News through song. C: You married a worship leader, Steve Lensink, who is a guitarist, keyboardist and vocalist. You often write, perform, and lead worship together. How have you grown together as musicians? BN: When I first met Steve, we both loved music but had no idea where God was going to lead us. Making music that connects to faith was a dream for both of us, if I’m honest. It is what connected us to each other in the beginning. We would speak for hours about this dream that we had to play music together and lead people into the presence of God. It’s been a gift to work together. I'm such a dreamer and love diving into what the songs mean and the lyrics, sharing about the stories and scriptures behind songs. Steve is steady and focused. He's a great bandleader. He's able to set up all the behind the scene things details that welcome people into a space of worship. Working with Steve has allowed me to flourish in my own gifts and learn more about what a team is. C: You also work as a worship leader at C4 church that just released its first EP, entitled Hallelujah. What’s the vision for this EP? BN: These songs have come out of our church. There is a group of writers that have been getting together for a few years and writing about what God's doing in our community at this church. There are so many stories of victory and how God has just revealed himself to people. There has been healing from sickness, and broken marriages made whole. We still need God and He continues to bring beauty from pain. C: You often speak about the role of music in leading people to Jesus. What’s your theology of music? BN: I think my duty as a worship leader to lead people to Jesus. If God is on His throne and He abides in the praises of His people, then those moments that we devote to praising Him are similar to our entering into the Holy of Holies. In terms of corporate worship, I want to help bring people into the presence of God. I don’t just want an emotional experience. In the presence of God is freedom, hope, joy, and healing. That is a beautiful place to be. C: You just came back from recording your second record in Nashville with a new EP with David Leonard of All Sons and Daughters. Take us through the process of writing the album. BN: My last record was really about what I had gone through. It was a story of the tough stuff that I had been through and how God had pulled me out of those times with His love and his grace. This new record is quite the opposite. It's all about looking forward. It’s about the process of “not looking right, not looking to the left” but instead being faithful to that call God has placed on my life. Working with David Leonard was a wonderful experience. I had actually just recently been challenged by someone to be bold in my prayers, to ask God for the things I was scared of. The next day, I got a text. David had a studio spot free and he worked so graciously with us to craft this next album. Working with him was an answer to a prayer I had just finally gotten brave enough to speak out loud. C: Is there an enduring theme that emerges on the new EP, one we can look forward to hearing? What is your hope for people if they listen and worship along with you? BN: I hope people can meet Jesus in a new way when they listen to these songs. We live day to day bombarded by the world around us. We’re busy. We have families. We have jobs. We're involved in so much. We lose sight sometimes of where God is calling us and what our purpose is. Yet God continues to pursue His people. I hope as people listen to these new songs, they remember to turn their eyes to Jesus. He equips and he makes the way. He provides. He makes all things new. Brooke Nicholls is a Canadian worship leader from Toronto, ON.